The shrinking of mudflats along the coasts of the Chinese Yellow Sea is an increasing problem for migratory birds that travel between Siberia and Australia. Research by an international team of ecologists, led by Spinoza laureate professor Theunis Piersma, a senior scientist at NIOZ Royal Netherlands Institute for Sea Research and professor in Global Flyway Ecology at the University of Groningen, shows that three different species are in decline because of one common factor: loss of food and habitat along the coasts of the Yellow Sea, because of the increasing claim of land by the Chinese government. The research, published in the Journal of Applied Ecology, involves three migratory bird species. The red knot (Calidris canutus piersmai) breeds on islands north of eastern Siberia. The great knot (Calidris tenuirostris) breeds in the alpine areas of north-eastern Siberia, and the bar-tailed godwit (Limosa lapponica menzbieri) breeds in the lower wetlands of north-eastern Siberia. All three of these species winter in Roebuck Bay, Western Australia. On their way between Asia and Australia they roost and refuel along the coasts of the Yellow Sea. Thanks to thousands of color ringed birds, and more than thirty thousand resightings of these birds, the ecologists were able to calculate the annual, as well as the seasonal survival of the three species between 2006 and 2013. The production of eggs and fledglings was no issue in that period. Also, the survival in their Australian wintering grounds was normal. However, from 2010 onwards, the survival showed a sharp decline in a period that included the spring and fall migration, as well as the breeding period. Because the snow melted relatively early on the breeding grounds in those years, there was no reason to believe that the survival was any different during that period. That left only one culprit: the conditions during migration along the Yellow Sea, where significant loss of habitat was going on because of land claim by the Chinese government. Previous research by the group of Piersma has shown that the survival of birds like the knot and the godwit is normally evenly spread across the year. 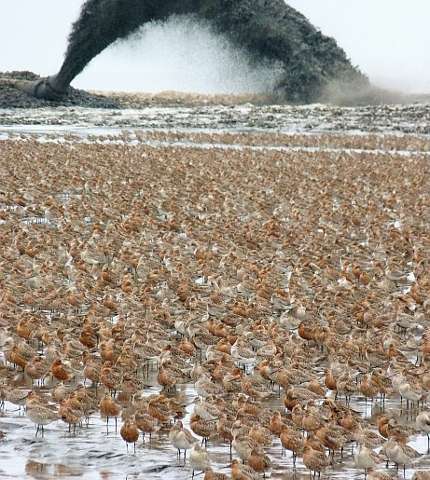 Until 2010 this was also true for the knots and the godwits that roost along the shores of the Yellow Sea. The populations were stable. With the decline in survival in 2011 and 2012, however, the populations began to shrink. 'Should the survival continue to shrink like it did in these years, we'll see a decline in these populations to half within three or four years', Piersma predicts.